Thiru-navuk-arasar (Appar) flourished in the 7th century A. D. He is one of the four Saiva Samaya Acharyas (Saivite spiritual teachers). He was born in Thiruvamoor in Thirumunaipadi Nadu. 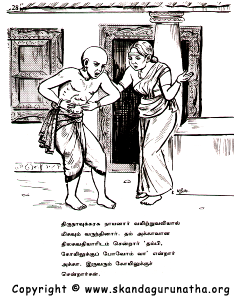 Pukalanar was his father; Mathiniyar, his mother. 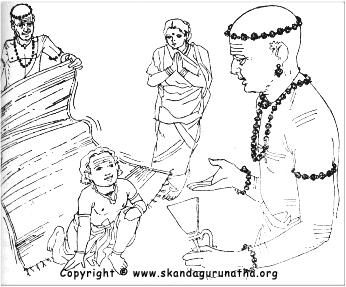 Mathiniyar gave birth to a daughter whom they named Tilakavathi. After some years, Mathiniyar had a son whom they called Marulneekiar (meaning "the dispeller of darkness or ignorance"). Early in life, Marulneekiar mastered all the Shastras. When Tilakavatiar reached her twelfth year, she was betrothed to Kalaipahayar, a military commander in the Pallava army. Before the wedding, however, he was sent by the king to fight and he died in battle. Pukalanar fell seriously ill and died. Mathiniyar committed Sati (died on the husband's funeral pyre). 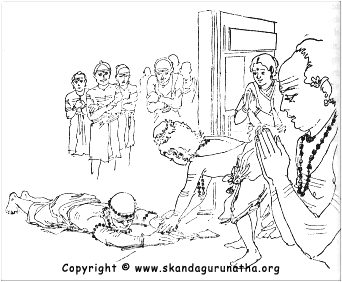 As the children were recovering from this shock, the news of Kalipahayar's death reached Tilakavathiar. And as she (since her betrothal) regarded him as her husband, she decided to commit Sati, too. But, Marulneekiar pleaded with her reminding her that now she was his mother, and also threatened to die if she would not change her mind and live. 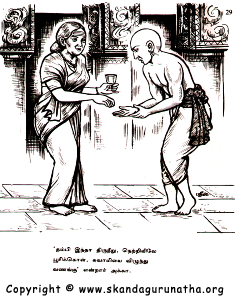 Tilakavathiar changed her mind for the young brother's sake. Even though she was young, she led the life of an ascetic. She was highly devoted to Lord Siva. Her glorious ascetic life has been sung by Sekkilaar, the author of Periya Puraanam. She was mother to Marulneekiar (who later became known as Appar). Marulneekiar, even while young, had realised the unreality of the world. He engaged himself in all kinds of charitable works. He was eager to find out the best religion and to follow it. He had heard much about Jainism and its wonderful practice of Ahimsa. He believed that Jainism would give him emancipation and so became a convert. He even went to Pataliputra (in South Arcot district) and joined the Jain school. He attained mastery over all their scriptures. Tilakavathiar was heart-broken over this change in her brother. She abandoned her native place and settled in Thiruvadigai Virattanam, in a mutt she built there. She prayed fervently to Lord Virattaneswarar to save her brother and shower His grace upon him. The Lord appeared in her dream one day and said, "My child, your brother has already done severe tapas in order to attain me. I will surely turn his mind, by making him suffer from severe colic, and then take him to my fold." Marulneekiar fell a victim to severe colic. He could not bear the pain. The Jains tried their best but could not relieve the pain. He felt intuitively that it was an eye-opening experience and lost faith in Jainism. He thought of his sister. He threw away the Jain garb and without informing anybody, returned to his sister. Marulneekiar fell at her feet and prayed to her to protect him. She understood it was Lord Siva's leela, and said that by the grace of Siva, he would be all right. She smeared the holy ashes on his forehead and repeated the Panchakshara Mantra. His ignorance immediately vanished. She then took him to the temple of Virattanesvarar where Marulneekiar worshipped the Lord and sang a hymn, "Oh Lord, I have insulted you and your religion. I have committed many evil acts. Once on the bank of Godavari, I argued with the saints and established the superiority of Jainism. For all this evil, Lord Yama himself has come to me in the form of this excruciating pain. Oh Lord, You are my sole prop and refuge. Save me. I will ever keep your lotus feet in my heart." When Marulneekiar concluded the song, the pain disappeared. A celestial voice said, "From now on you will be known as Thiru-navuk-arasar (Lord of Speech). Your glory will spread everywhere." Thus, Lord Siva's grace restored Thiru-navuk-arasar (Appar)'s faith in Saivism. Tilakavathiar was immensely happy, too. Thiru-navuk-arasar (Appar) became a staunch devotee of Lord Siva and lived every second for Siva by repeating the Panchakshara Mantra. The Jains at Pataliputra were afraid that, if the king came to know that because of their inability to treat Thiru-navuk-arasar (Appar) (whom they had given the name Dharmasenar) he had left them and gone back to Saivism, the king would take them to task. So they concocted a new story and showed Thiru-navuk-arasar as a traitor against the king and the royal religion, viz., Jainism. The king ordered his ministers to produce Thiru-navuk-arasar (Appar) before him. They went to Thiruvathikai, with an army. When Thiru-navuk-arasar (Appar) heard of the charge against him, he said, "Oh Ministers! I am no longer your king's subject. I am the subject of Lord Siva, the protector of all beings, the destroyer of all sins, the Lord of all gods, the bestower of immortality and eternal bliss. Disobedience to the king may amount to treason in the case of other people, not mine, because I am under His protection. Fear cannot approach me, because I am under the protection of the One who once kicked Lord Yama, to save His Siva bhakta." The ministers recognised his greatness but were afraid to return without Thiru-navuk-arasar (Appar). They, therefore, begged of him to come with them out of his supreme compassion, and to establish the glory of Saivism. Thiru-navuk-arasar (Appar) obliged and went with king's ministers. The very sight of Thiru-navuk-arasar (Appar) enraged the king who asked the Jain heads to decide upon the proper punishment to be meted out to him. They suggested that he be thrown into a burning lime kiln. Accordingly, Thiru-navuk-arasar (Appar) was shut up in a kiln for seven days. He remained there, fixing his mind on the Lord and repeating Siva's name. By Siva's grace, the heat of the kiln was transformed into a cool breeze. At the end of seven days, the Jains, to their surprise, found Thiru-navuk-arasar (Appar) alive and absorbed in deep meditation. They attributed this to the power acquired by him when he was a Jain  and advised the king to poison him. Again, by the grace of Lord Siva the poison was transformed into nectar. Again, the Jains attributed this to the efficacy of the Jain mantras which Thiru-navuk-arasar (Appar) had learnt from them, and advised the king to have Thiru-navuk-arasar (Appar) trampled by the elephant. Thiru-navuk-arasar (Appar) boldly facing the elephant sang a hymn in praise of the Lord. 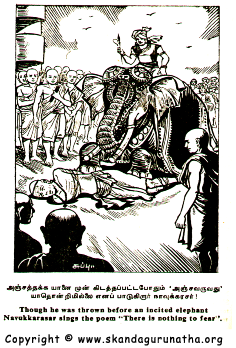 Thiru-navuk-arasar (Appar)'s loving look transformed the elephant's nature and it went round him and prostrated to him. The Mahouts goaded it but the elephant got wild and attacked the Mahouts and the Jains and killed some of them. Those who escaped ran to the king and fell at his feet. This was a great disgrace. The king was greatly worried. The Jains finally advised the king to have Thiru-navuk-arasar (Appar) tied to a stone and thrown into the sea. In accordance with the king's orders, this was done. However, Thiru-navuk-arasar (Appar) fixed his mind on Lord Siva and was continually repeating the Panchakshara Mantra. Thiru-navuk-arasar (Appar) sang hymns in praise of the Panchakshara. As soon as he finished the song the stone began to float. 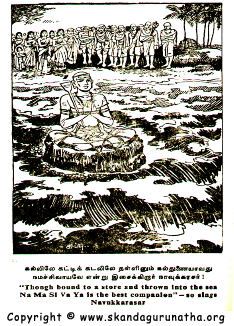 Thiru-navuk-arasar (Appar) sat on the stone and was happily borne on the waves, which safely took him to the shores of Thiruppapuliyur. Thus, did the Lord save His bhakta. At Thiruppapuliyur, there was a huge congregation of Siva bhaktas to welcome Thiru-navuk-arasar (Appar). He worshipped Lord Siva and sang hymns in praise of Him, "Oh Lord, the unseen Protector! You are my guide and saviour. You are my father, mother, sister and everything. Oh Lord of Mercy, You saved me from all dangers. Due to Your grace and love alone I am alive." Addressing the mind, Thiru-navuk-arasar (Appar) says, "Oh mind, when you have totally surrendered yourself to Him, why do you fear any danger? Nothing can harm you. Fear not." Again, turning to the Lord, Thiru-navuk-arasar (Appar) says, "Oh Lord of Mercy, I want no more birth. If I take birth at all, owing to past karma, let me remember your name always. Even if I take birth as a worm, let me not forget your name. Let me find delight in uttering your name." Then Thiru-navuk-arasar (Appar) returned to Thiruvathikai, after visiting many holy places on the way. When Pallava king who persecuted Thiru-navuk-arasar (Appar) came to know this, and when he recalled the many miracles he had witnessed, he was convinced of the superiority of Saivism. He went to Thiruvathikai, fell at Thiru-navuk-arasar (Appar)'s feet, and begged his pardon. Thiru-navuk-arasar (Appar) embraced the king with all love and affection, and the king embraced Saivism and built the magnificient temple of Siva called Gunabharaveechuram at Thiruvathikai. Thiru-navuk-arasar (Appar) then spent his days in worshipping and serving the Lord in various ways, to set an example even to saints that they should not relax their eternal spiritual vigilance, lest they should fall a prey to maya. Thiru-navuk-arasar (Appar) exhorted other saints to lead the ideal life of a humble devotee for the guidance of others. Thiru-navuk-arasar (Appar) also visited many sacred shrines, thus, emphasizing the glory of pilgrimage. The thought that Thiru-navuk-arasar (Appar) had lived for some time with the Jains, eating their food and mixing with them made Thiru-navuk-arasar (Appar) feel that his body was still impure, for the worship of Lord Siva. He prayed to Lord Siva, "I do not want to live any more in this impure body. Let me have the stamp of your Trident and Nandi on my body, and then I shall regard it as fit for Your worship." At once, a divine servant of Lord Siva approached Thiru-navuk-arasar (Appar) and put the stamp of the Trident and Nandi (one of the Saivite rituals of initiation, according to the Agamas) on Thiru-navuk-arasar (Appar)'s shoulders. He, thus, experienced supreme bliss immediately. Thiru-navuk-arasar (Appar) then went to Chidambaram. The very sight of the temple tower sent him into a trance. He sang thrilling hymns here and prayed, "Let me serve you. Your bhaktas know no want nor fear. Even Lord Yama cannot dare to approach them. I have come to your abode where no sin can approach. I have surrendered myself to You. I have enshrined your lotus feet in my heart." At Chidambaram, Thiru-navuk-arasar (Appar) heard of the glory of Thiru-jnana-sambanthar and how the child prodigy was blessed by Mother Parvathi. Thiru-navuk-arasar (Appar), therefore, was very eager to meet the great child saint who was at Shiyali. As Thiru-navuk-arasar (Appar) was proceeding towards Shiyali, Sambanthar also was happy and was eagerly looking forward to meeting Thiru-navuk-arasar (Appar). When Thiru-navuk-arasar (Appar) reached the outskirts of Shiyali, Sambanthar went forward to receive him. They fell at each other's feet, and set an example in saintly conduct. Thiru-navuk-arasar (Appar) and Sambanthar then went to the temple and worshipped the Lord. At Sambanthar's request, Thiru-navuk-arasar (Appar) sang a hymn here, "When the whole world was submerged during Pralaya, Lord Thoniappar (Siva) was seated with his consort in the boat of Pranava (OM) surrounded on all sides by Devas in the form of birds." Even now the temple of Lord Thoniappar is in the form of a boat. They who cling to His feet are protected. Along with Sambanthar, Thiru-navuk-arasar (Appar) visited the temple at Thirukkolaka. Thiru-navuk-arasar (Appar) then took leave of Sambanthar and left the latter's ashram and after visiting many shrines, reached Thiruvaavaduthurai. He sang a hymn here expressing intense vairagya, "Oh Lord, I am caught in the wheel of births and deaths. I am tired of this. Show me a way to get out of it." Then he came to Sattimutham. He prayed to the Lord, "Oh Lord, place thy lotus feet on my head before I leave this body." The Lord said, "Come to Thirunallur. I will fulfill your wish." Thiru-navuk-arasar (Appar) accordingly went to Thirunallur and worshipped the Lord who placed His Feet on the head of Thiru-navuk-arasar (Appar). He then sang, "Oh Lord, thy holy feet are adored by men on earth and the gods in heaven. Even great tapaswins cannot touch your feet if their devotion to you is tainted. But they are easily accessible to the real devotees who serve with faith and devotion. The sacredness of your divine feet cannot be understood by ordinary men. They [your feet] are the bestowers of all prosperity and immortal bliss." 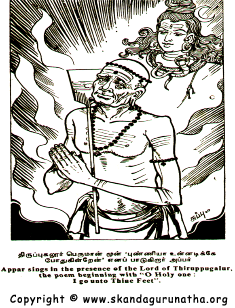 After visiting some more places of pilgrimage, Thiru-navuk-arasar (Appar) went to Tingalur, where he formed a miracle and brought saint Apputhi Adigal's son back to life (we shall read this in Apputhi Adigal Nayanar's life). At Thiruvaaroor, Thiru-navuk-arasar (Appar) was given a rousing welcome by the Siva bhaktas. He had the Lord's darshan there. His heart was overflowing with love. He shed tears of love. He danced in joy. He was immersed in divine bliss. He sang hymns expressing regret for his mistake in joining Jainism. He felt that he would have been blessed with the Lord's darshan earlier had he remained a Saivite and carried on with his worship of Siva with devotion. Thiru-navuk-arasar (Appar) also sang a hymn praising the sincere devotion and greatness of Nami-nandi Adigal  who lighted the lamp with water in this sacred shrine when he could not get oil anywhere. Then Thiru-navuk-arasar (Appar) went to Thirupukalur, after visiting other shrines on the way. Thiru-jnana-sambanthar was there, too, and the two saints met each other for the second time. 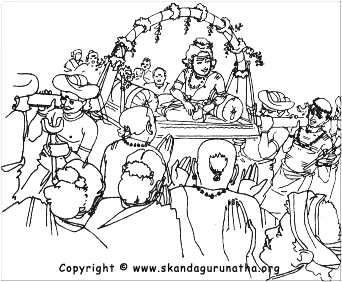 At Appar's request, Sambanthar went to Thiruvaaroor and had the Lord's darshan there. Both the saints remained at Thirupukalur for some time and many other saints took this golden opportunity of having the darshan of these two great Acharyas (spiritual preceptors) together. Nilakantha Yalpannar, Siruthondar, Muruga Nayanar and many others came to Thirupukalur, and the place was converted into a divine realm during the stay of the two Acharyas. The two saints then moved on to Thiruveelimalai. Famine raged there at that time. Thiru-navuk-arasar (Appar) and Sambanthar were greatly moved by the suffering of the people and prayed to the Lord for relief. The Lord promised to give them a golden coin each every day, with which they could feed the people. Lord Siva placed two coins, one at the western entrance and the other at the eastern entrance to the temple  both Thiru-navuk-arasar (Appar) and Sambanthar collected the coins and relieved the suffering of the people. The famine soon came to an end. Both the saints praised the glory of the Lord and left. Then they came to Thirumaraikadu or the present Vedranyam. Once upon a time, the Vedas themselves used to worship the Lord here. When people neglected the study of the Vedas, this was discontinued. From that time, the door by which the Vedas used to enter, remained closed. There was another door by which people would go in and worship. Appar and Sambanthar heard of this when they came there. Sambanthar desired to enter through the door which remained closed. He requested Appar to sing a song. The doors opened by themselves, by the Will of God. They went in and worshipped the Lord. 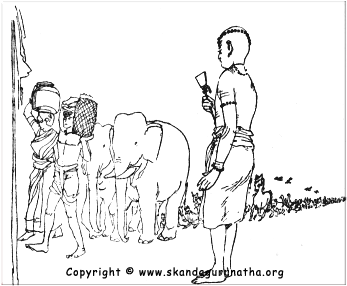 When they returned to that entrance, Appar requested Sambanthar to sing a song, so that the door could close again. Sambanthar sang and the door closed again. At night one day, Lord Siva appeared and commanded Appar to come to Thiruvaimoore. The Lord appeared before him and walked in front of him. Appar followed Him, but could not approach Him. Suddenly the Lord entered the local temple and disappeared. Appar went inside the temple but could not find the Lord. In the meantime, Sambanthar, learning of Appar's departure, followed him and came to the temple. Appar entreated the Lord to bless Sambanthar with darshan of Siva. The Lord fulfilled Appar's wish. Then, they went to Thiruvaimoore and from there returned to Thirumaraikadu. Mangaiyarkarasi Ammaiyar and Kulachirai Nayanar (the queen and the minister of the Pandyan king, respectively) sent messengers from Madurai to Sambanthar, reporting the evil influences of the Jains and urging for Sambanthar's immediate presence in Madurai. Sambanthar wanted to go there immediately. Appar, in the meantime, told him of all that happened to him and tried to stop him from going. But, so great was Sambanthar's eagerness to serve the Lord, that he went anyway (this is continued in Thiru-jnana-sambanthar's life story). Thiru-navuk-arasar (Appar) then visited Thiruvaavaduthurai, and came to Palaiyarai. Here he came to the Vadathalai temple and worshipped the Lord from outside. He came to know that the Jains had converted this into a Jain temple, and that they had removed the Sivalingam to an unknown place. He prayed to the Lord, "Oh Lord, I will not proceed an inch from here till I have the darshan of your image which has been removed by the Jains to an unknown place." The Lord appeared before the king in his dream and said, "Oh king, my bhakta Thiru-navuk-arasar (Appar) is fasting to have my darshan. Go at once and drive out the Jains, so that Thiru-navuk-arasar (Appar) could enter the temple and have my darshan." Lord Siva also told the king where the Lingam lay hidden. The king woke up and immediately summoned his ministers. He went to the temple, drove away the Jains and fell at the feet of Thiru-navuk-arasar (Appar). The temple was immediately reconverted into a Siva temple and the Lingam installed once again. Thiru-navuk-arasar (Appar) worshipped the Lord and was happy. During another pilgrimage, Thiru-navuk-arasar (Appar) felt the pangs of hunger as he was approaching Thirupainjeeli. Lord Siva wanted to appease Thiru-navuk-arasar (Appar)'s hunger and thirst, so Siva created a tank and a garden on the way, so that Thiru-navuk-arasar (Appar) could quench his thirst and rest in the garden. The Lord Himself waited there in the guise of a Brahmin, with food in hand and gave it to Thiru-navuk-arasar (Appar) as soon as he arrived. Appar took the food, drank the water and was resting when the Brahmin enquired where Thiru-navuk-arasar (Appar) was going. 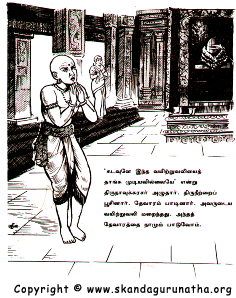 Thiru-navuk-arasar (Appar) said that he was going to Thirupainjeeli. They both started to walk. When they were near the place, the Brahmin suddenly disappeared, and Appar understood that it was none other than the Lord Himself. He wept bitterly for not recognizing Lord Siva earlier and rolled on the ground on account of his separation. After visiting Thiruvannamalai, Kancheepuram, and Kalahasthi, where he sang the glories of Kannappar, Appar felt a desire to go to Kailasa. He went to Banaras and worshipped Lord Viswanath. He turned northwards and crossed many thick forests infested by wild animals. By Thiru-navuk-arasar (Appar)'s mere look, the wild animals became tame! He walked night and day. His feet were sore. Then he crawled with his hands. His elbows began to bleed now. Then he used his chest and crawled on. His chest also began to bleed and the ribs began to break. Still, Appar, undaunted, continued his journey to Kailasa, rolling on the ground. Appar wanted to go to Kailasa but the Lord wanted that Thiru-navuk-arasar (Appar) should live in the world for many more years singing His glories. The Lord created a tank nearby and appeared before Appar in the form of a saint, with matted locks, rudraksham and holy ashes. The saint found out from Appar that he was proceeding to Kailasa and said, "Oh friend, the Lord of Kailasa cannot be seen by human beings. So, turn back." Appar said, "So long as I have this body, I will not turn back without going to Kailasa." He turned towards the saint again, bowed to him, and began to part for Kailasa. Appar understood it was the Lord Himself. The Lord afterwards kept Appar invisible company, giving him encouraging words now and then. Appar mentally prayed to the Lord, "Oh Lord, give me a fresh body, so that I may continue the journey." The Lord directed Thiru-navuk-arasar (Appar) to take bath in a near-by tank and said, "You will see me and my abode (Kailasa) in Thiruvayar." Appar, repeating the Panchakshara Mantra, took a dip in the tank. He came out of the tank, and found himself in the tank at Thiruvayar  hundreds of miles away to the south! Thiru-navuk-arasar (Appar) came outside and saw everywhere Siva and Sakthi. He entered the temple and saw Mount Kailasa there. He saw Lord Siva seated with Mother Parvathi, surrounded by gods, and celestial servants praising his glory. Thiru-navuk-arasar (Appar) went into a trance, sang Lord Siva's glories and danced. 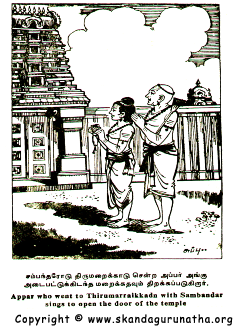 Then, Thiru-navuk-arasar (Appar) had a mutt built for him at Thirupoonthurai and remained there. 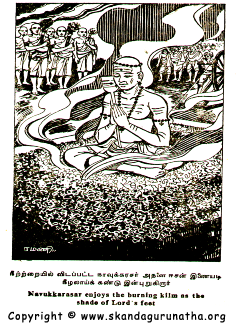 Sambanthar had, in the meantime, defeated the Jains at Madurai and was coming to Thirupoondurai. Appar went forward to receive him. Without Sambanthar's knowledge, Appar quietly joined those who were carrying Sambanthar's palanquin. On reaching Thirupoonthurai, Sambanthar cried out, "Where is Appar?" and Appar, from below the palanquin coolly announced himself. Then, Thiru-navuk-arasar (Appar) wanted to see the state of Saivism in the Pandyan kingdom, for himself and left for Madurai. 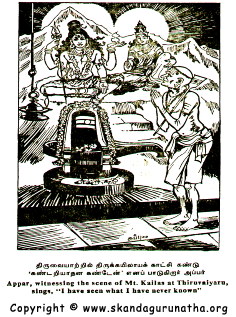 The king (Ninra-Seer-Nedumaar Nayanar), the queen (Mangaiyarkarasi Ammaiyar Nayanar), and the minister (Kulachirai Nayanar) welcomed Thiru-navuk-arasar (Appar) with devotion. Appar remained there for some days, worshipping the Lord. Then he went to Rameswaram and other sacred places before returning to Thirupukalur. Lord Siva wanted to test Thiru-navuk-arasar (Appar) at Thirupukalur. So when Appar was doing his services in the temple, the Lord made the entire floor appear as though it was strewn with gold and diamonds. To Appar, gold and diamonds were worthless as straw. So, he collected all of them and threw them in a near-by tank. Again, the Lord made celestial damsels appear before him and tempt him with their charms. Appar remained undisturbed. His entire heart and soul was centered on the lotus feet of the Lord. Having passed all the tests Lord Siva gave him, Appar spent the rest of his life there and at the age of 81 merged himself in Lord Siva.